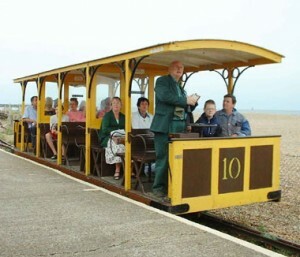 The railway will open again on Wednesday 10th April – look for newly restored cars 4, 6 and 10. 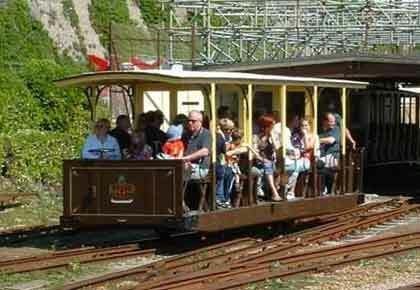 Volk’s Electric Railway normally opens each year shortly before or at Easter and will run until the END of October. Trains run every 15 minutes after starting, at half past, quarter to, on the hour and quarter past until the last train of the day. A journey from Aquarium Station to Black Rock Station takes about 12 minutes in total. Allow 30 minutes for a return journey. Service times may vary due to adverse weather conditions or special events. See www.volksrailway.org.uk for latest updates. Fares and Times for 2019 – PLEASE COPY THE LINK BELOW TO THE COUNCIL’S WEBSITE AS WE WILL NO LONGER SHOW THEM HERE. Trains may be boarded at any station. Other tickets are available – please refer to the Council’s website as shown above. FAMILY SAVER TICKET – 2 adults and 2 children up to 14 VERA MEMBERS – on presentation of valid membership card GROUP RATES AND SCHOOLS – Available for pre-booked parties of 10 or more. COMBINED TICKETS – Special combined event tickets may be available. 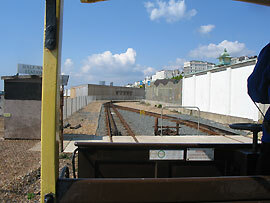 The stations are all accessible by wheelchair and pushchair. Wheelchairs and pushchairs must be folded to fit on the trains or they can be left on the platform at Aquarium Station (at owner risk). Public toilets with disabled facilities are close to each station. There are also toilets in the children’s playground at Paston Place, near Halfway Station. Coach and car parking spaces are available near the Black Rock Station along Madeira Drive.